Paige Dingess received her Bachelors of Arts in Psychology from The George Washington University in 2013. As an undergraduate student, Paige worked as a research assistant in the Brain and Navigation Laboratory under Dr. John Philbeck, the focus of which was to determine how we use visual cues to navigate through our environment. She also obtained two minors in Biology and Mind/Brain studies as well as a concentration in cognitive neuroscience. 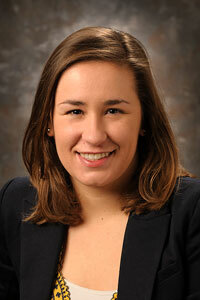 Paige is currently a neuroscience graduate student working under Dr. Travis Brown. B.A. Psychology; Cognitive Neuroscience Concentration, 2013, George Washington University, Washington, D.C. I am interested in studying how exposure to drugs of abuse and consumption of certain diets modify reward circuitry within the brain and specifically how these actions induce structural plasticity. I will be using a number of behavioral paradigms, staining techniques, and eventually electrophysiology to explore these mechanisms.